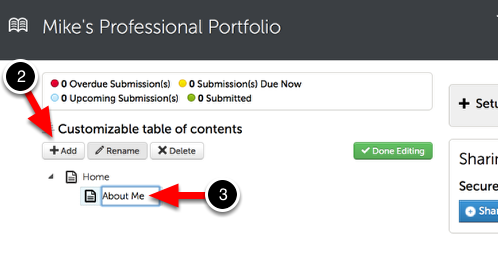 Once the Customizable Portfolio has been created, you will need to build the Table of Contents/structure for it. This lesson will teach you how to create sections and sub-sections in your portfolio. NOTE: By default, you will already have a 'Home' section in your portfolio. You will add new sections and sub-sections below this home section. 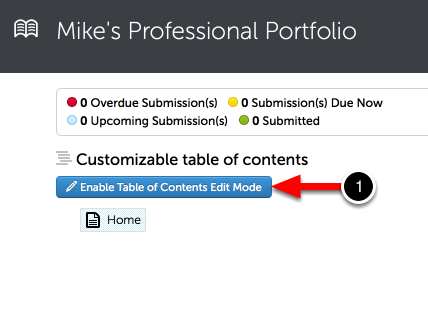 Before you can add main pages to your portfolio, you must enable the Table of Contents Edit Mode. What is a 'main page'? A main page is a sub-page to the "Home" page in your portfolio. You can add main pages to your portfolio, and sub-pages to your main pages. 1. Click on the Enable Table of Contents Edit Mode button. 2. Click on the +Add button to add a new main page. NOTE: To continue to add main pages to your portfolio, you must click on "Home" before clicking "Add" again. 3. Enter a Name for your new page. 4. You can select the page to Add a sub-page to, Rename, or Delete. 5. Click the Done Editing button. 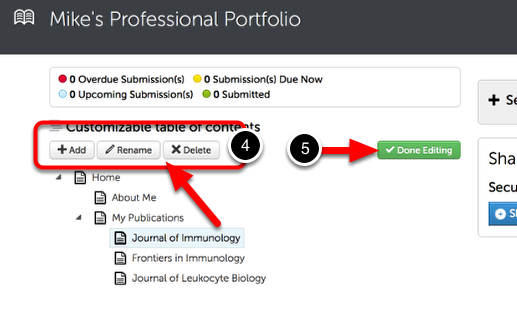 NOTE: You can return at any time to add, rename, or delete pages from your portfolio.